Pony Parties are a great way to celebrate your child’s birthday! 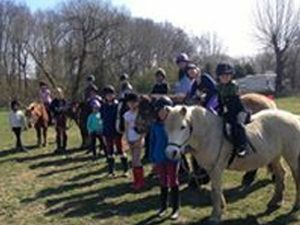 Our Pony Parties are a great way to celebrate your child’s birthday! 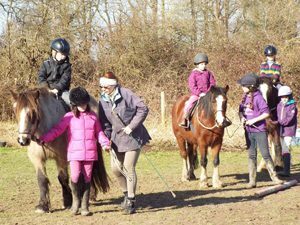 Celebrate your child’s birthday with a Private Pony Hack, ideal for groups of 3 to 6 children. Each child is assigned a pony and a helper and they help us groom and tack them up before we go for a ride along the country lanes and bridle paths around the riding school. This activity is a favourite for children aged 7 to 9. No experience around ponies is necessary. We only ask that children come in long, comfortable trousers and welly boots (preferably no trainers). * Note: 50% non-refundable deposit will be required to confirm your booking, with the balance payable a week before the party. Let us organize a fabulous Pony Party in the Paddock for your children. All we need is a group of 8 to 14 children. We will match 2 children up with a pony and a helper. They will help us groom and tack up the ponies, go for a ride around the field taking turns leading or riding. We then return to the riding arena to play gymkhana games in teams of 3 or 4, depending on how many children there are. It is non-stop fun! You will also be invited to come early and decorate the Party Shed (no balloons please) and stay after the games to have your Birthday Tea. Time with the Ponies: 90 minutes plus Tea Time after! * Note: We will request a 50% non-refundable deposit to book your party. Balance will be payable 7 days before the party.